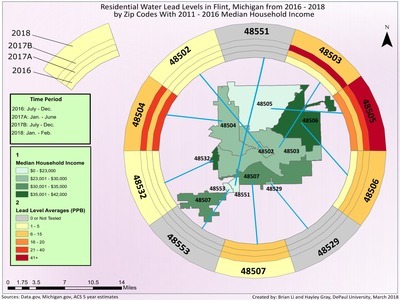 This map by Brian Li and Hayley Gray was created in GEO 346: Health GIS in the winter of 2018 as part of their final project that analyzes the relationship between residential water lead levels (WLL) and socioeconomic factors in Flint, Michigan during the ongoing Flint water crisis. This ringmap shows the average WLLs for each zip code in Flint for 4 testing periods (1 for each ring) between 2016-2018 and the median household income for each zip code from the latest ACS 5-year estimates to examine if there is any relationship between the two. The WLL in parts-per-billion (ppb) were from the 1 liter calculations of the 2 bottle kit tests at various residential locations across Flint that were obtained from Michigan.gov. The point data from those datasets were joined by spatial location to the zip codes of Flint and summarized by averaging to get the WLL averages represented in each ring. A ringmap tool for ArcMap created by researchers at the Academia Sinica, Taiwan was used to create the rings and polylines that connect to each zip code. This map was further edited in Inkscape from the original to give more clarity. The results of this map show that there does not seem to be any explicit relationship between the two factors suggesting that this is more of a systemic issue than a localized one within Flint.